Cool oscillation station! Place the magnet wires on the base, move them, and watch the unique ways they oscillate as their invisible magnetic forces "bounce" off one another. Station allows for lots of additional interactions--observe as you make iron filings dance and propel steel balls inside the clear viewing tray, add more movement by spinning the station's turntable, investigate eddy currents, and more. 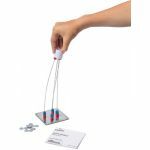 Explore force (including magnetism) and interactions, motion and stability, energy, waves, engineering design, patterns, and cause and effect. 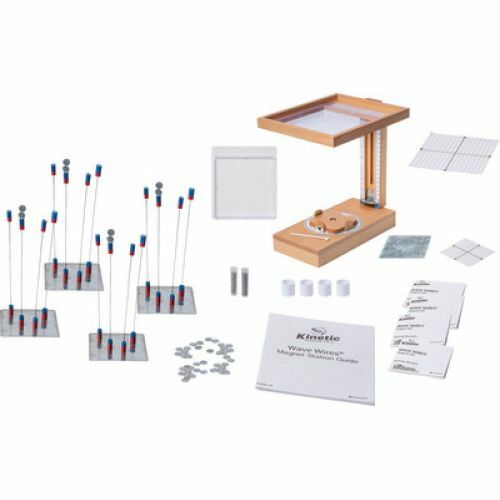 Includes enough materials for teacher demo and 4 small groups: wood station with turntable, 2viewing trayswith graph insert, steel station base with placement grid, 4 steel bases, 16 magnet wave wires, 48 steel disc weights, 4 plastic starting rings, tube of iron filings, tube of steel balls, measuring spoon, 4 student mini booklets, and 48-page teacher's guide. 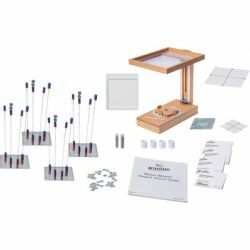 Great for classroom science labs, STEM and STEAM programs, science fairs, maker spaces, and more!